SAN FRANCISCO (AP) — Zany experiments testing scientific theories in real-world settings have earned the TV show "MythBusters" a devoted following, but a stunt gone awry met with an unhappy audience when an errant cannonball went shooting through a California family's bedroom. 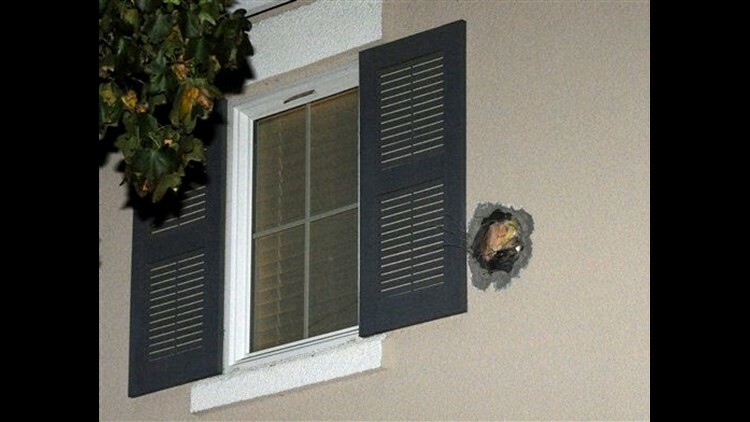 Sheriff's deputies are still measuring how, exactly, the cannonball flew from a bomb range in the rolling hills flanking a suburban San Francisco Bay area neighborhood and rocketed into the front door of a home and through its master bedroom before landing in a neighbor's parked minivan. Producers for the Discovery Channel show fired the cannonball Tuesday as they filmed an episode testing whether other types of projectiles shot from a cannon would pick up the same speed and have the same impact as the steel ball. Later, the team plans to film flying stone cannonballs at a rock quarry in Northern California. Instead of hitting a string of water-filled garbage cans, however, the cannonball passed over the barrels, crashed straight through a protective cinderblock wall and careened off the hill behind it, said Alameda County Sheriff's Department spokesman J.D. Nelson. "It missed the target and took kind of an oddball bounce," Nelson said. "It was almost like skipping a rock on a lake. Instead of burying it into the hill it just went skyward." No one was injured, and the home's residents didn't even wake up until the broken drywall settled on top of them, Nelson said. The show's co-hosts planned to go to the neighborhood to speak with those affected Wednesday afternoon, and a meeting was called with the entire production staff to understand what went wrong. "We are really, really grateful and glad that no one was hurt," co-host and executive producer Adam Savage said in an interview. "Discovery is committed to making this right and making sure that everything that has been damaged is as good or better as before this started." Producers have used the cannon they built at the county's bomb range, which is tucked in a valley in the suburb of Dublin, more than 50 times without incident, said Nelson, the department's liaison to the show. Once it was launched, the cannonball traveled about 650 yards, bounced in front of the home, then tore through the front door and exited through a wall on the back of the house. The projectile then bounced at least once more and crossed the road before smashing the window and dashboard of a gold minivan, where it came to rest. Jasbir Gill, who owns the minivan, said he and his children had just gotten home. "It's scary," Gill told the Contra Costa Times (http://bit.ly/umCZnD). "I was in the van five minutes before this happened." "Mythbusters," which is produced for Discovery Channel by the San Francisco-based Beyond Productions, issued a statement through publicist Katherine Nelson on Wednesday saying all proper safety protocol had been observed. "Beyond Productions is currently assessing the situation and working with those whose property was affected," she said. The show, according to its website, mixes "scientific method with gleeful curiosity and plain old-fashioned ingenuity to create (its) own signature style of explosive experimentation." President Barack Obama appeared on a segment last year aimed at testing whether the Greek mathematician Archimedes actually used only mirrors and the reflected rays of the sunset to set fire to an invading Roman fleet.